Laxmi Niwas Palace Hotel, a premium Hotel in Bharatpur, offers a cozy and comfortable rooms that are provided with all amenities and luxuries. There are 20 spacious and elegant rooms in the hotel that are tastefully decorated and furnished with antique furniture. Our rooms provide you an experience of the past, but at the same time provide you all the amenities of modern life. The attached bathroom is spacious and provides you hot and cold running water, clean towels and high quality toiletries. The view from these rooms is very beautiful and fills you with new energy. They either overlook the beautiful garden surrounding the hotel or the large swimming pool. 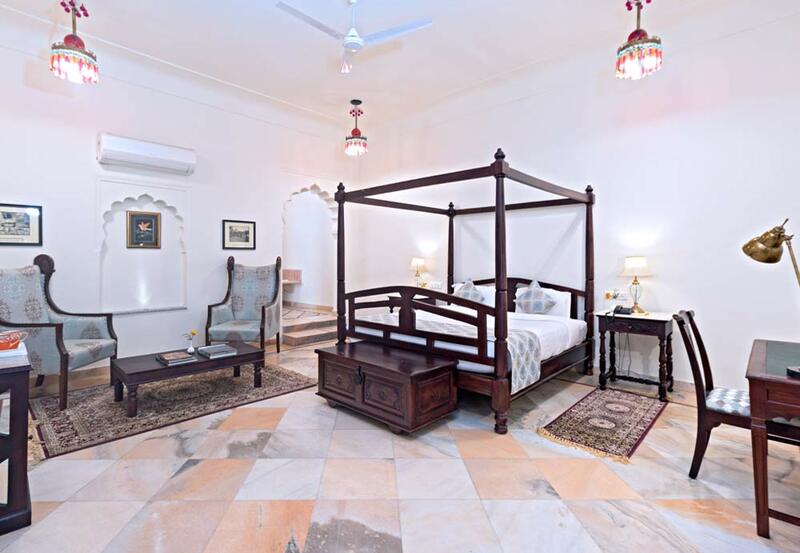 Our rooms are designed in typical Rajasthani style and offer you a royal feeling. They are categorized into Classic Room and Suite. These are provided with all modern facilities like LCD TV with cable connection, air conditioners, tea/coffee maker, telephone, safety locker, mineral water and a luxurious wash room. The rooms are also provided with a balcony or a sit out where you can sit and relax, enjoying the cool breeze from the surrounding garden. Our hotel comprises of dedicated and experienced staff who always treat you politely and with a smile on their lips. They are ready to serve you and help you with any problem. All these amenities have made Laxmi Niwas the best hotel in Bharatpur. Other than providing the best accommodation in Bharatpur, we also provide you the best cuisines prepared by our experienced chefs. You are welcome to taste some of the local dishes of Rajasthan as well as international cuisines. You get Indian, Chinese and Continental dishes that stimulates your taste buds. The bar at the hotel is an ideal place to sit and relax after a tiring day. The fruits and vegetables used in the preparations are taken from our own organic farm and therefore free from any pollutants. Being the premium hotel in Rajasthan, no wonder it is a well sought after hotel and a favorite with many customers. So book your rooms in advance and ensure you accommodation. You may book your rooms online or through telephone. Book your rooms today itself and experience the heritage of Rajasthan! The royal suites are uniquely decorated in a blend of royal tastes. The suites are perfectly furnished with all the basic amenities and an attached bathroom. The suites are accommodated with king size bed with the option of an extra single bed along with a sitting area for a pleasant view. Premium linen and amenities that include air conditioner, bottled water, phone, safety box, etc are available on just one call at the reception. The attached bathrooms have 24x7 running hot and cold water. All the royal suite rooms have balcony to enjoy the beauty of nature right from your room. Size: approximate 550 ft2 including balconies. 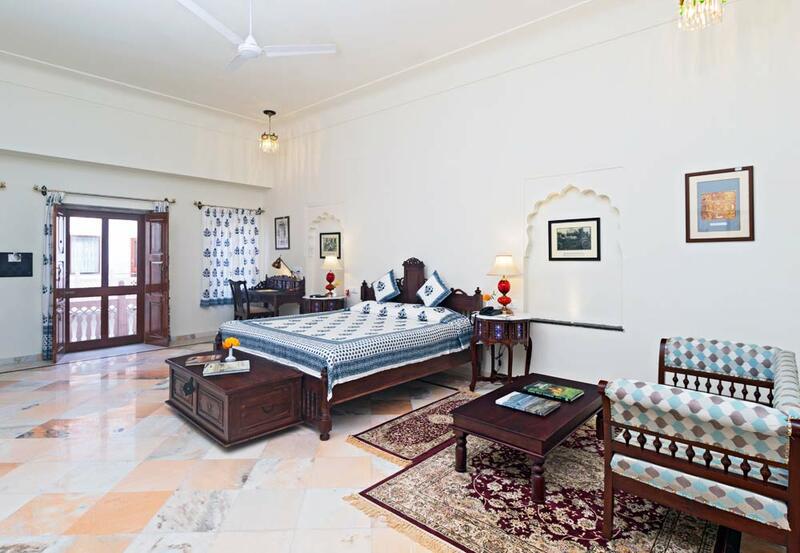 The classic rooms in the Laxmi Niwas Palace are beautifully decorated Facing the marble fountain in the inner courtyard are the Classic rooms with large king size beds for maximum comfort and are tastefully decorated . The timeless beauty of Jat dynasty is what make these rooms beautiful. From the finely furnished furnitures to the amazing courtyard view, everything will leave a mark of brilliance and heritage after your stay. The rooms have all the basic amenities that include air conditioner, attached bathrooms with 24 hours hot and cold running water, study desk, and phone. Size: approximate 300 ft2. Kindly note twin bed rooms are also available on request.